Dependencies are the relationships among tasks which determine the order in which activities need to be performed. Tasks may have multiple preceding tasks and multiple succeeding tasks. The most common dependency relationship is a finish-to-start relationship. Task P (predecessor) must be finished before task S (successor) can start. Our resource planning software only allows finish-to-start type task dependencies. Make sure you have dependencies turned on from general settings to use them. Make sure that the succeeding task is also visible in the Gantt chart area. The checkbox appears once you open the first task. Successor and predecessor connections are listed just under the task pop-up window. 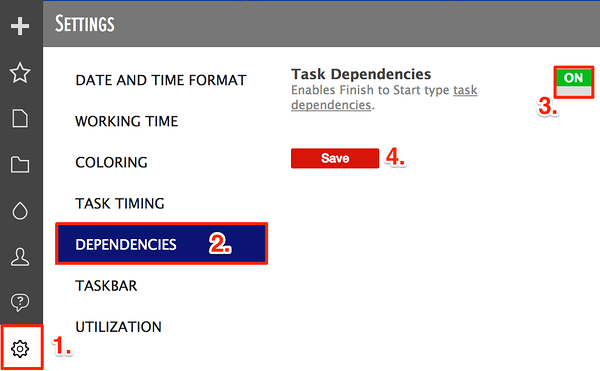 You can also change minimum lag time ('Min Lag Time')/gap between predecessor and successor tasks using the same steps. You'll find it on the left from the dependencies you have set. If you are changing the lag time, click on 'Save' once you are done. If you reschedule/drag and drop the predecessor / first task slot to an earlier time (while 'Min Lag Time' is 0d 0h), the successor/second task will stay in the same place. If you reschedule/drag and drop the predecessor/first task slot to later time than the beginning of successor task (while 'Min Lag Time' is 0d 0h), the successor/second task will be rescheduled so the gap between them decreases to the point two tasks meet. If the 'Min Lag Time' is set to other value (f.e 24 hours/1 day), it will stay the same if you reschedule the successor task to a later period. 'Min Lag Time' will not remain while rescheduling the successor task to an earlier period of time. In case of multiple connections, you'll see the grey line for direct path. You'll find it below everything else. Task dependencies should be switched on by default. If you disable the feature all the dependencies will be permanently deleted. You can now add dependencies or all the dependencies will be deleted. Did not find the answer to your question regarding task dependencies?